I really love winter, it is my favourite season, and although so far this month has been pretty rainy and grey I am still much happier in a big jumper and a cup of tea than in a summer dress and a lolly pop (although I do love lollies). Plus getting to wear all those winter warmers is an even better excuse to accessorize yourself up to the eye balls. I am a person who does like a bit of costume jewellery, normally chunky and colourful. It is a great way to jazz up a otherwise boring black jumper or give a bit more life to your trusty winter coat. To cheer yourselves and add some brightness to those short winter days why not pin on one of the fabulous brooches I have in my Notonthehighstreet shop. 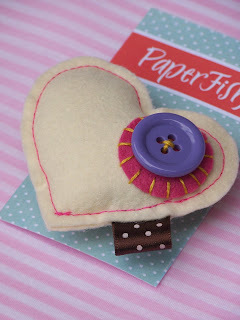 Pin on this sweet Paperfish heart brooch for a surefire way to add some interest to a classic brown jacket, I think this would look fab on tweed. 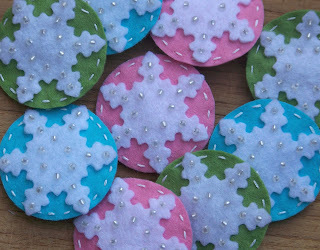 With this set of pin back badges from Summersville you can mix and make colours and patterns to create different looks. Pin on singularly for a pop of colour or group 3 together for more of a statement. Or these slightly sparkling snowflake brooches from yours truely. Hand beaded with little frosted glass beads to give an ice cold feel. I always think craft things look like food things Mrs B, dont know if that says more about us than we like to reveal.